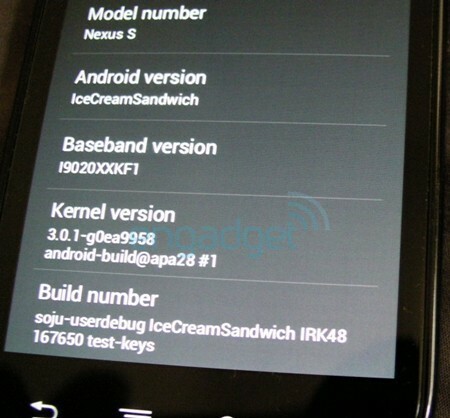 The one Android update to rule them all -- better known as Ice Cream Sandwich -- is penciled in for an official launch sometime in the next two months, so it's only natural for some shots to leak out. We just weren't expecting a two-minute video showing off a few of the new features. As the story goes, a lucky gent ordered a Samsung Nexus S on eBay and, upon its arrival, noticed that his new prized possession looked a little... different. Hopping over to the About screen, he was shocked to discover that the device was running ICS. The firmware appears to be operating on the same baseband as the screenshots leaked a few weeks ago, but it's running on an updated build (IRK48) and kernel (3.0.1). We can see plenty of influence from both Gingerbread and Honeycomb here, as well as four shortcuts on the bottom (a definite bump from the two found on vanilla 2.3). There's a new Google Apps icon which opens up a tray containing a number of featured services put out by the search giant, and long-pressing the home button brings up a vertical Honeycomb-style multitasking menu. The notification bar, camera UI and other menus also have a much different look. Granted, all of this could just be a custom ROM built to emulate the latest Google dessert, so we can't be a full hundred percent certain that it's authentic. If it's not, at least we can give credit for it being incredibly elaborate. Enjoy the video and additional screenshot below. Update: Our anonymous tipster has confirmed to us that shortly after we posted this video, his Nexus S was remotely locked and wiped. You can follow the entire saga over at this XDA Developers thread.